After receiving a notable gum sole look, Nyjah Huston‘s Nike SB Nyjah Free signature shoe now has a clean “Blue Fury” colorway. 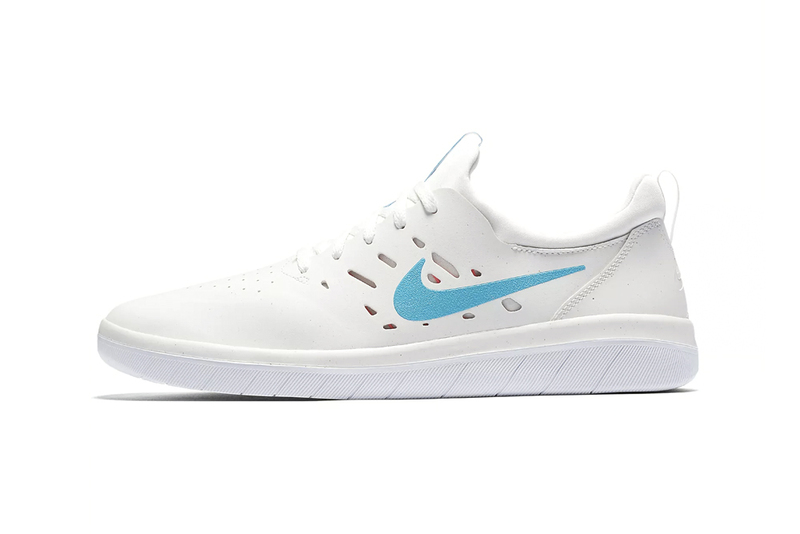 This time around the skate icon’s model features a lightweight white upper with a midfoot cut-out design aided by light blue Swoosh branding and a “NYJAH” marking on the on the tongue pull tab. Elevating the shoe is a purple Free medial segmented attached to the pure white patterned sole system that provides the shoe with superior grip. Expressing a new age skate construction and choice elements of Nike‘s Free tooling, Nyjah Huston’s SB Nyjah Free is quickly rising on the skate scene being lauded for its flexibility and durability. Priced at $95 USD, the SB Nyjah Free “Blue Fury” is available now online and at select Nike Skateboarding retailers. For more Nike, take a look at the sportswear giant’s new “Team Orange/University Red” Air Max 180 colorway.